This blog post continues with all the objects and settings from SecureFile LOB - the empty table. The insert of one row with a small (1byte) LOB increases the complexity. berx.source_blobs contains some BLOBs of different size. In comparison to the Lob Extent Header of 1st extent this one has sdba: 0x0103ea01 - this points direct to the next block. But it's not of type 0x06=trans data but 0x3e=NGLOB: Committed Free Space. len:127 makes sense, as the next block (after 128 == 0x80) is again 0x45=NGLOB: Lob Extent Header. There is no data yet. hba: points back to 0x0103e582 - the 1st NGLOB: Hash Bucket of UFS. prev:, next: and head: is the block itself. Is similar to previous block, prev: and next: are empty. The next 2 Committed Free Space blocks are identical. Unfortunately I don't know anything about this block, yet. LoadTime seems to be epoc again. There are 50 such blocks - all looking similar, just no Chunk: dba: entries. This matches the PUA Batchsize: 50 from 1st extents NGLOB: Segment Header. The trans data blocks are equal to the empty blocks in 1st extent. The other NGLOB: Lob Extent Header have a sdba: which points to their following block and a len:127 - so they describe the next bunch of trans data blocks. It's unclear why this extent is required right now as it does not hold any valuable data. My assumption is the transaction (INSERT) I did - Every transaction on a LOB might require a NGLOB: Persistent Undo (even there is nothing to store in case of an insert). In the 2nd NGLOB: Persistent Undo in memory dump there I can see 0103E58B - the rba of 1st trans data. It gets the INODE of a LOB using DBMS_LOBUTIL.GETINODE. With this INODE it loops through all extents of this LOB, gets additional information with DBMS_LOBUTIL.GETLOBMAP and prints it. In this context the extent is a chunk inside the LOB storage, not an extend (as in DBA_EXTENTS). As DBMS_LOBUTIL is not documented, other sources are useful. ROWID and ROWNUM are information about the table row - they are more a reference to the row than a property of the LOB. The LOBID uniquely identifies the LOB. EXTENT# is the number of (LOB) extent - in case the LOB does not fit in a single extent. rdba points to the block where this extent starts. the length is 1 - as it's a 1 byte BLOB. 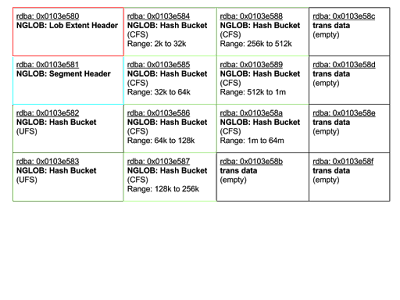 The blocks in the first extent changed as follows. The NGLOB: Lob Extent Header did not change. Of course scn: changed. seq: changed from 0x04 to 0x01 ( it's the 1st change in this scn). #extents: and #blocks: changed to reflect the new extent. Highwater:: now points to the 2nd NGLOB: Lob Extent Header in 2nd extent. #blocks below: changed from 16 to 144. There is a 2nd entry in Extent Map now. PUA cnt: is 1 - so there is 1 Undo Array available. In the PUA Array there is the 1st NGLOB: Persistent Undo referenced. FSG_COUNT: increased from 0 to 1. Not sure what FSG stands for, but it seems to be related to Free Space [whatever?]. Opcdode: increased from 0 to 1 and Xid: does contain a real transaction ID now. Fsbdba: and the Head Cache Entries points to the 1st NGLOB: Committed Free Space of 2nd extent (which pointed to this block as well). Still the UFS List is empty. All the other NGLOB: Hash Buckets - both IFS and CFS - are equal to before. In this block, in the header csc:, Xid and scn changed. The hwm is 1 now (was 8060 before). The 1st byte of data is 41 - ASCII for A - that's the content of my 1 byte file. This block really contains the LOB. lid has the same value (just lowercase) as LOBID in the table row - so it's an indirect pointer back to the row it belongs to. Unfortunately I did not find any indication which shows the block is used now (in comparison to previous dump) - any hint is very welcome! Here is a list of all the spfile parameters I found (and guess are) related to SecureFile LOBs. This Post will be updated with additional information whenever I collect them. Seems to be a bitmap of flags. I have to dig into structures of SecureFile LOBs right now. Unfortunately I do not find a lot of resources available, so I have to investigate at my own. This post is to document my findings. There is a lot of guesswork and interpretation here, so be careful if you use or refer to any information here. The whole testcase is on 12.1.0.2.170418 BundlePatch EE, Linux, 2 node RAC. sdba I don't know what this stands for, but it points to the 1st block of type 0x06=trans data. len probably a length of something - as it's 5 and the extent has 5 blocks of type 0x06=trans data, I guess it's the length (count) of blocks capable of data. synctime this looks like an unix epoc time - it matches to GMT: Tuesday, August 29, 2017 9:13:04 AM when I created the table. objid is the OBJECT_ID (or DATA_OBJECT_ID? I don't know) of the LOB segment. xid might be a transaction ID when used. entry 0 same as sdba and len from above - there might be multiple entries in the future? There is nothing of great interest for me in Extent Control Header. The first interesting part is CFS. CFS means Committed Free Space (blocks) - there are different "counts" - all of them 7 right now. UFS means Uncommitted Free Space (blocks) - it seems to have a count of 2. PUA might mean Persistent Undo Array (my guessing!) - no count right now. In Segment Stats, Free Space: is 5 which matches the 5 trans data blocks available. They are where the real data will go. UFS Array contains 2 blocks, so it matches the count above. CFS Array contains 7 blocks, which matches the count above also. PUA Array is empty - there are no NGLOB: Persistent Undo blocks right now. I have no idea what the different off: and sz: mean. Offset and Size? Again an empty block, but it contains a Range: 2k to 32k! There might be a good reason why the range starts at 2k: this is the smallest blocksize you can define at creation of a DB. As a LOB (when not stored in ROW) always uses at least one block, 2k is the smallest unit which needs to be managed. These different space chunks are designed to avoid fragmentation when deleting/inserting LOBs of different size. It's of typ: 5 - LOCAL LOBS. I don't think there is anything of interest in the empty block right now. Maybe more later. These are the 16 blocks we have. Data Security is becoming more and more important nowadays. In fact it was always important, just as the expected problems increase (by count or value) management seems to be more aware now. Due to many discussions I started to have a look at DBMS_REDACT - which is an implementation to show only those data to users they are allowed to use. One of my first places to go was Tim Halls Data Redaction (DBMS_REDACT) in Oracle Database 12c Release 1 (12.1). As always a very promising source. And a block which just counts from 1 to a maximal number for &SOME_VALUE, we will know the card_no for every customer_id. But this attack is somewhat time and resource consuming, so it can create traces in other areas like performance monitoring and therefore make an observant DBA suspicious. The CARD_NO values are hidden in the query output itself, but DBMS_OUTPUT.PUT_LINE can print them, when called in the WHERE clause. Still I see Data Redaction one valuable method to secure data, but it's limits should be known and proper additional methods should be implemented to secure data.